Added by popular request: a new way of modifying the notification and confirmation messages RSVPMaker sends when someone submits the form for an event. 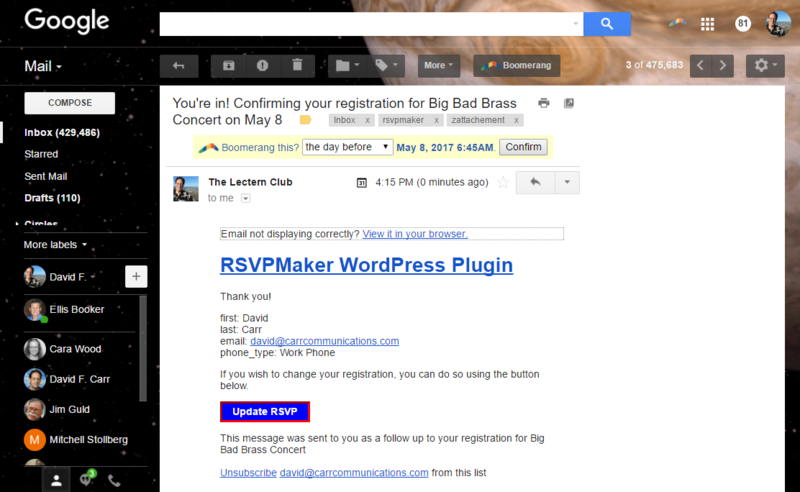 The default is still that a notification goes to the event organizer (or whatever email address or addresses you supplied) saying something like “RSVP YES for The Big Event on May 1” and the attendee gets a version that says “Confirming RSVP YES for The Big Event on May 1.” By default, the confirmation message also includes a button people can click to update their RSVP. The notifications editor opens up possibilities for adding personality to these transactional messages. It also simplifies the process of localization, since “RSVP” is not universally understood across languages and cultures. The information you record here should be generic enough to apply to all your events. 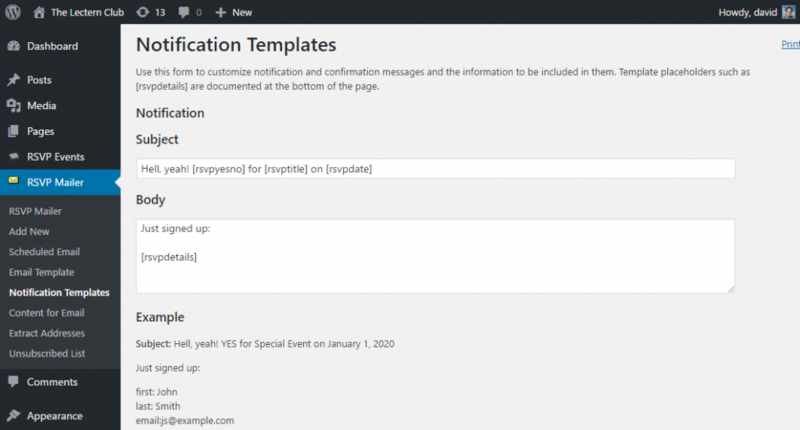 You still get the option to add a per-event confirmation message, which will be included as long as your template includes the [rsvpmessage] placeholder (one of several documented on the page for the template editor). By default, the confirmation message is just “Thank you!” but I’ve also used RSVPMaker to register people for webinars where that message includes detailed instructions for accessing the online event. For a terrestrial event, it might be driving directions. The Notification Templates screen is distinct from the Email Template screen, which you use to define one or more templates for the layout of your HTML email, for example to specify a background color. Notification messages use the default template defined on that screen. While RSVPMaker is intended to be useful out of the box, I continue to look for ways to let you make it your own. If you create extensions to RSVPMaker, there are filters and actions you can tap to extend this feature as well. Your filter would be passed an array and return your modified version with additional entries in the same format. The filter for that is ‘rsvpmaker_notification_sample_data’. Finally, there is a ‘rsvpmaker_notification_templates_doc’ action you can use to add to the documentation at the bottom of the page. As part of my WordPress for Toastmasters project, I plan to use this same template utility for confirmation and reminder messages for specific meeting roles.